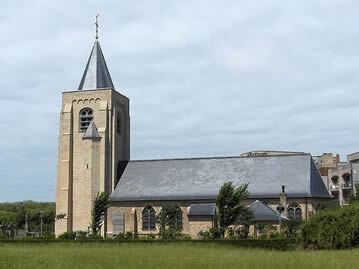 The saint-Willibrordchurch is the parish church of Middelkerke. The tower is a relic of the church of the 17th century. It first served as a lighthouse. Apart from this tower, the church was demolished in the middle of the 19th century and was replaced by a neo-Gothic church. After its destruction in the first world war, the church was rebuilt in he 1920s, and expanded in the southern direction, adding a second south-east tower. 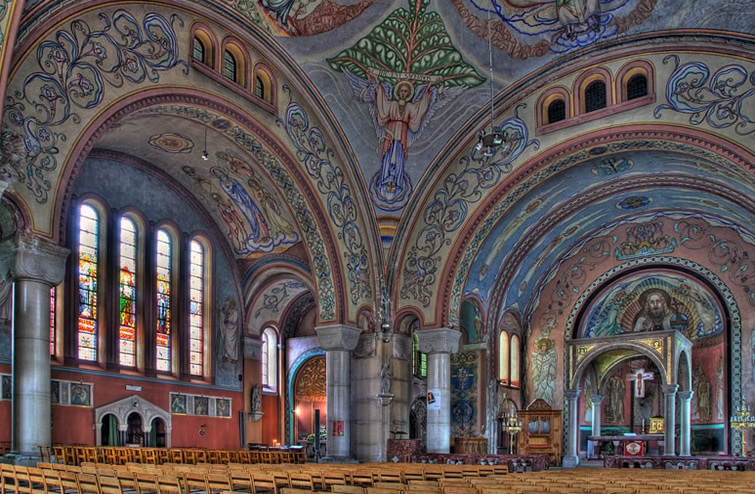 The interior in neo-Romanesque-Byzantine style is simply beautiful. Inside, in the right nave, you'll find the miraculous cross buried on the beach during the 16th century to protect it against the iconoclasts. The sea made it reappaear in 1657. The cross has been saved! 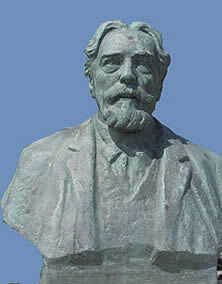 To the fishermen who found the statue, this was a miracle. Ever since that moment the cross received a place of honour in the Church. The church dating from 1071 is located in a protected dune and polderlandscape. It has been through a lot in its long history, was several times destroyed and rebuilt again. 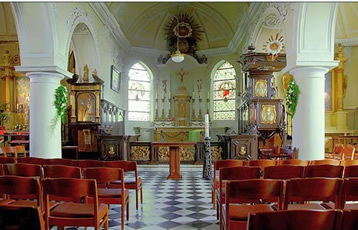 Its classicistic principal altar dates from 1771-1772 and has the shape of a tomb. The large painting above the altar was created probably in the Antwerp School, possibly by from Gaspar de Craeyer (1584-1669), court artist to the Archduke. 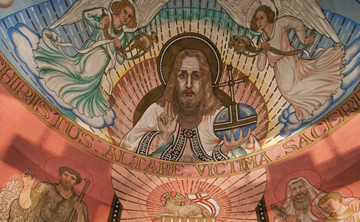 It is the jewel of the church, made with a masterly talent and is of great value. It is a scene with castaways surrounded by Spanish ships. Over the clouds, a fulminating Christ in a red robe is watching furiously. 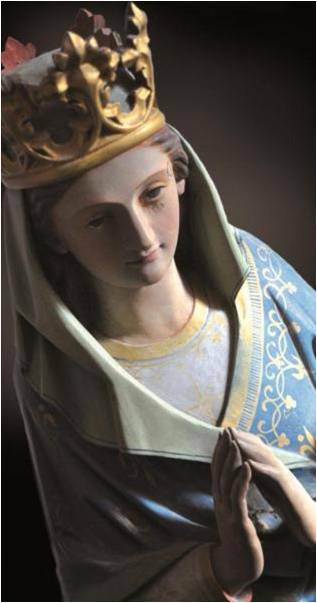 While praying, our Lady points at the drama of the three ships and eight castaways in the unleashed sea. In the Aisle you’ll find the altar of our Lady in black granite. On the altar framed in silver gilt, you’ll find the statue of Our-Lady-of-the-Dunes . This statue in polychromed wood dates from the 17th Century. It is surrounded by ex-votos, model ships and ship photos, witnesses of the devotion for Our Lady, Star of the Sea (Stella Maris). On the left of the altar stands a silver processional cross from 1756. 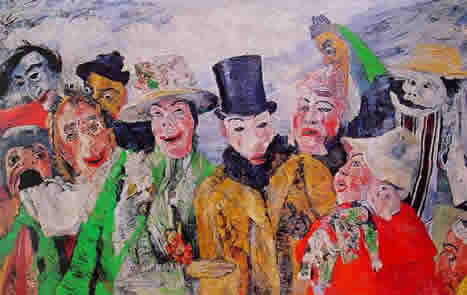 In the small graveyard, three mayors of Ostend and painter baron James Ensor are buried. 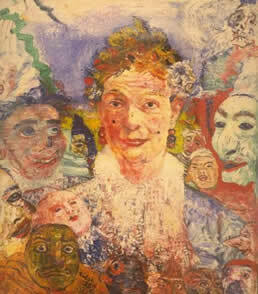 Two of his famous paintings. Stene was first mentioned in 1142 as a 'Stenes' which meant 'castle' in those days, probably because of the stronghold that had been erected here. Other sources state that the name referred to a stone wharf that was located in the town. Na de religieuze onlusten van de 16de eeuw moest de Onze-Lieve-Vrouwekerk in Leffinge (deelgemeente Middelkerke) tijdens de vroege 17de eeuw vermoedelijk volledig herbouwd worden. De toren stortte in 1690 in en richtte heel wat schade aan. Diverse herstellingswerken, uitgevoerd tijdens de 18de en 19de eeuw, konden het verdere verval van de laatgotische kerk niet verhinderen. Een plan uit 1857 voor een volledige nieuwbouw en een ontwerp van Pierre Buyck uit 1871 voor de uitbreiding en restauratie van de bestaande kerk werden nooit uitgevoerd. Uiteindelijk werd toch geopteerd voor een nieuwbouw in neogotische stijl, ontworpen door de Brugse architect Antoine Verbeke. De werken aan de driebeukige kruiskerk met voorgeplaatste westtoren konden starten in 1877 en waren in 1879 voltooid. De kerk werd volledig in baksteen opgetrokken, met gebruik van natuursteen voor de raamtraceringen, de druiplijsten en de balustrades. 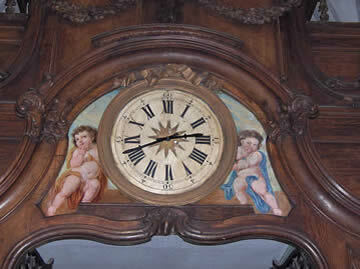 Het interieur was oorspronkelijk kleurig afgewerkt met sjabloonschilderingen. 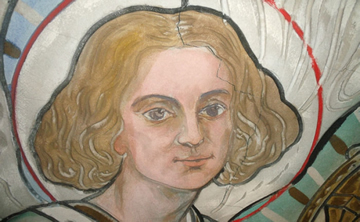 De voor het kleine dorp Leffinge erg monumentale kerk kreeg al snel de bijnaam 'kathedraal van het noorden'. 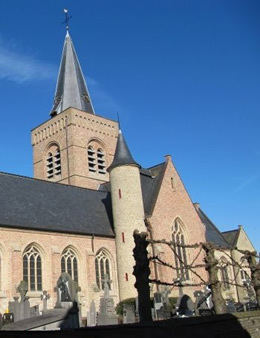 Rond de kerk werd een kerkhof aangelegd, afgesloten met een ijzeren hek. Dit kerkhof zou in 1957 ontruimd worden, waarbij de graven werden overgebracht naar de voormalige Duitse begraafplaats in de Leffingestraat. Het kerkgebouw liep ernstige schade op tijdens de Eerste Wereldoorlog. Stabiliteitsproblemen leidden in 1969 zelfs tot het idee om de kerk volledig te slopen, maar de kerk werd in 1976 beschermd als monument. Het voormalige kerkhof werd als landschap beschermd. Uiteindelijk werd in 1983 gestart met een volledige restauratie, maar omdat de werken dermate traag vorderden, moest de kerk in 1995 voor het publiek gesloten worden.In 2012 werd de kerk opnieuw in gebruik genomen. 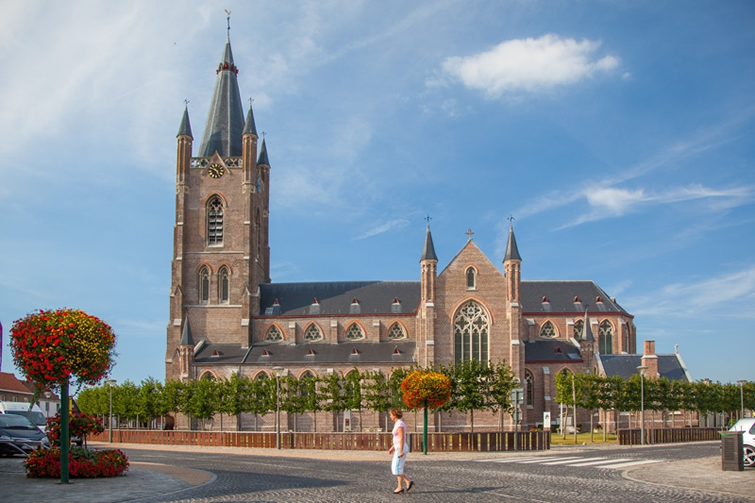 In 2012 Slijpe celebrated the end of a decade of restoration works on the church. Apart from the church there are several other buildings that refer to the presence of the Knights Templar, a religious order of knights that guarded pilgrims to the Holy Land in the Middle Ages. The tower and the eastern part of the Neo-Gothic church burned to ashes in 1822 by a vicious fire. 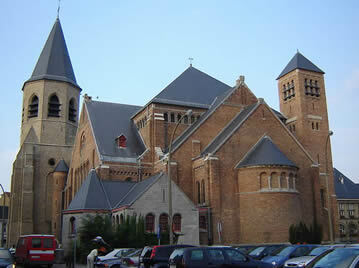 In 1896 the church was renovated and enlarged based on a plan designed by the architect J. Soete (Roeselare). Since the church got severely damaged during the First World War, extensive renovation works were needed in 1919. 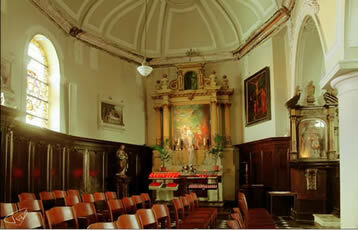 T. Raison, an architect from Bruges, maintained the appearance of the pre-war hall church. Around the church there is a walled cemetery with some old linden. The little chapels along the access path are dedicated to the Sacred Heart and they commemorate the victims of the First World War. An eighteenth century statue of the Crucifixion, standing on a rock pile and underneath a canopy, can be found near the east facade. 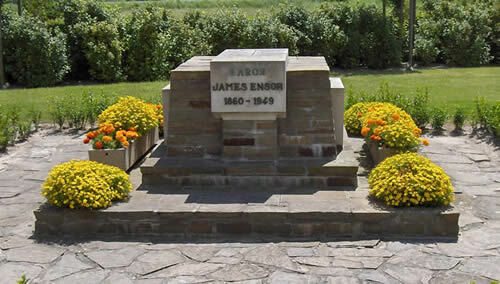 Near the central choir facade you can see the tombstone of Jan Janss(eune) (he probably died in 1549), a member of the Order of Saint John. His coat of arms is pictured on the stone as well as the worn symbols of the evangelists on the corners. 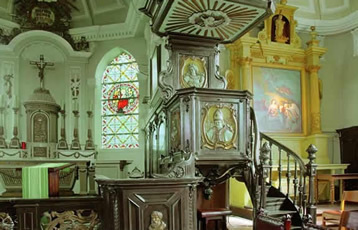 The church furniture includes a marble baptismal font (1651), a Neo-Gothic pulpit (early twentieth century) and two tombstones (1534 and 1559). There is a Lourdes grotto in the southern transept. 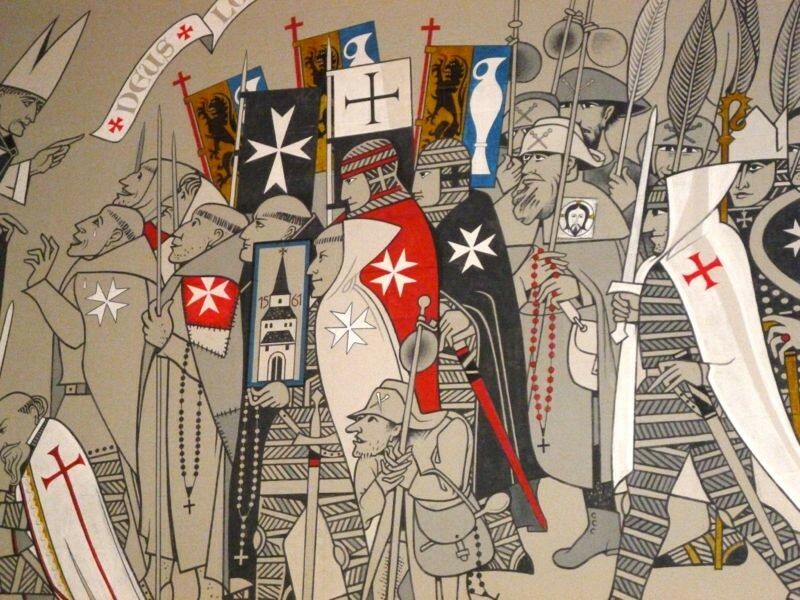 The monumental murals were recently added by the graphic artist Arno Brys from Bruges to put the Templars past of Slijpe in the limelight. They depict, among other things, the Knights Templar and the Knights Hospitaller. 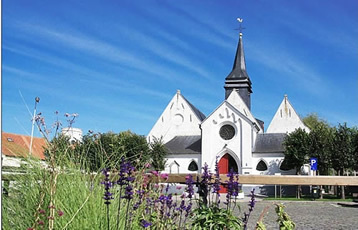 The new church was a project of prestige by king Leopold III, who was so enthusiastic that he was suspected of setting fire to the original church himself. 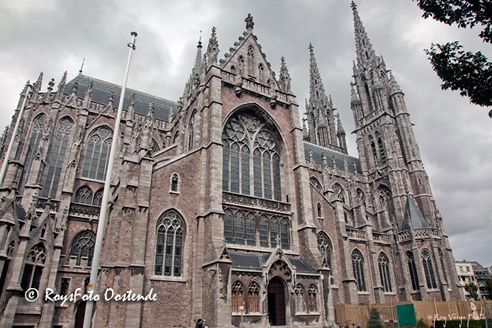 Architect Louis Delacenserie from Bruges was inspired by the ‘ideal’ building plan for a cathedral, such as that of the Cologne Cathedral and the Votive Church in Vienna. The church is oriented to the West. King Leopold placed the first stone in 1901. During both World Wars the building suffered great damage. In between the two doors of the entrance stands a statue of Mary with baby Jesus. 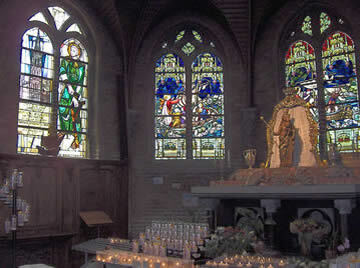 To the right and left of the entrance stand the patron saints of the church, Peter and Paul. 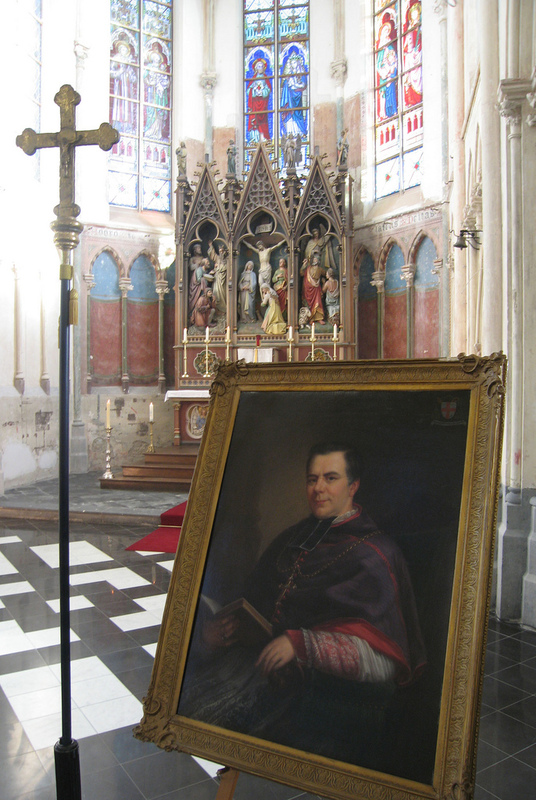 Behind the choir we can find the Queen’s Chapel with the white-and-green marble tomb of queen Louise-Marie (1812-1850), spouse to Leopold I. 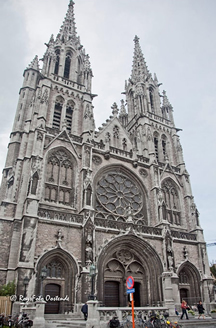 On the outside this chapel is richly decorated with gargoyles and sculptures of canonized queens. Within, visitors are greeted by two polychrome stone statues of Saint Peter and Saint Paul. 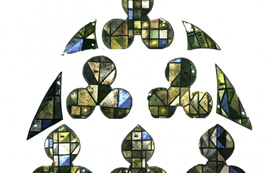 The windows refer to kingship and Christ. 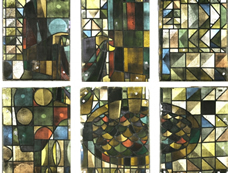 The windows in the church tell the history of Ostend and depict the apostles, historical figures, saints of the region and Biblical scenes. The church treasure includes silver objects and embroidered garments. 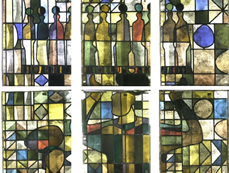 On the windows of the southern transept we can see among others the representation of the Belgian monarchs and queen Louise-Marie. The interior shows Neo-Gothic elements. The church possesses stone statues of the Evangelists (P. Breacke), a white stone cloister in bas-relief (J. Gerrits), oak choir stalls, stone communion rails, a marble pulpit, confessionals made of oak and blue freestone, and a copper font. In the northern transept a big engraved copper plate can be found, in memory of war victims.